As humans, we put a lot of effort and time into building our ideal careers and lives. But how much time do we invest in the most valuable asset we have? The one thing where our true potential is first imagined and then manifested – our minds. We have between 50,000 – 70,000 thoughts per day and most of these are fear focused/designed to protect us. Our minds filter these thoughts in a process known as DDG (Deleting, Distorting and Generalising), retaining only the important thoughts. We have far more control over what we think than we realise, like choosing our shoes each day, we get to choose how we want to feel and who we want to be. Coaching as a profession drew inspiration from the world of sport. It wasn’t long before the world of business recognised the importance of mastering and enhancing our inner world in order to thrive in both our professional and personal lives. Pioneers of personal and career coaching include Timothy Gallwey, whose book the Inner Game of Tennis (1974) has been widely renowned as a significant influence in the development of coaching (Brock 2008, O’Connor and Lages 2007). Thomas Leonard another leading coach and financial planner of the 1980’s made significant contributions to the coaching field. Being the best version of yourself is only possible if you choose the thoughts – the story – that enables you to walk tall, bring your strengths forward when you need them most. What really matters is being in the moment, not living in the argument you had with your partner last night, or worrying about what’s going to happen tomorrow just before stepping into the boardroom. Being in you’re a game zone when you need it most. So how do you master your mindset and help yourself to reach your full potential? Put simply, mindset is a person’s way of thinking and their opinions. Here are 3 tactics we use with our clients in our training and support sessions to foster a positive mindset. Start the day as you mean to go on by surrounding yourself with things that remind you of all of the reasons why you know you can achieve your goals. Your mind is a computer! Fill it with the stimulus it needs to be unstoppable. Postcard summarising your recent achievements, list of your strengths, do something every day that you are passionate about, understand your key drivers and what motivates you to be the best version of yourself. Fear, anxiety and stress are all signs that we’re feeling out of control. These mental and emotional states encourage inaction, making us feel helpless. It’s not what happens to us but how we respond that matters. If a situation is causing you to feel negative, regain power by identifying what is within your control and invest your valuable head space and energy here. Instantly you’ll feel better and move towards a solution. It’s amazing how different you can feel within just a few minutes. You control whether you create a positive day or a negative one by how you interpret and act on your thoughts and external environment. Positivity breeds positivity. 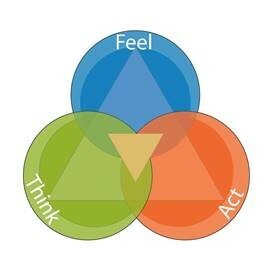 How we think affects how we feel and how we feel affects how we behave – all of which impact on how we live each day. This domino effect happens within our minds each and every day. Shake off an unhelpful mood by fast-forwarding to the end of your day and choosing how you’d a) like to feel and b) what you’d like to have achieved that day. In order to achieve ‘a’ and ‘b’, what type of thoughts do you need to manifest for yourself? Where do you need to focus your mind to get there? Comparatively, where would your current more negative outlook lead you? 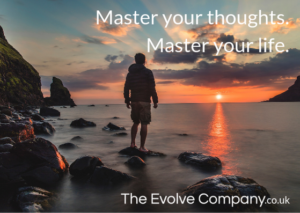 Put simply, master your thoughts and you’ll master your life. ← How to start enjoying public speaking & transform your career.